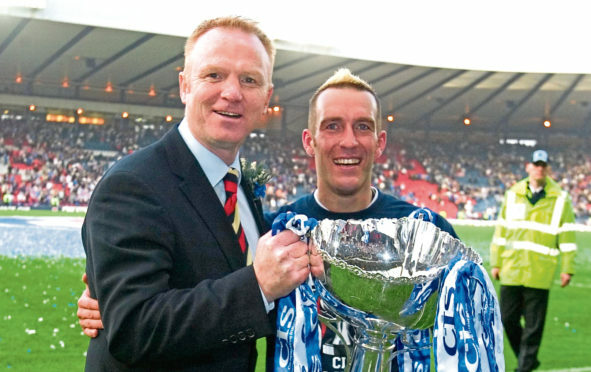 Diagnosed with motor neurone disease six years ago, the former Rangers captain is now in a hospice in Airdrie, unable to fly back to his home in Spain after taking unwell at a Light Blues fans event last October. He made an indelible impression on the club and its fans during his six years at the club. And even though it’s 13 years since he and Hamed Namouchi both left Ibrox, the French-born Tunisian internationalist thinks about his former team-mate every day. Namouchi won a Premier League medal in 2005, and was a regular during the Champions League campaign the following season which saw Alex McLeish’s side get through a group which contained Inter Milan and Porto before being knocked out in the last 16 by Villareal. He insists the key to the Gers success lay with Dutchman Ricksen. “On the field, you could see the spirit he had. He was always running and working for his team mates,” he said. “In the changing room, he solved every problem. “When someone was down emotionally, he would go and have a talk with them. “He was the man who pushed you to work really hard. “We had many, many games and sometimes we were down because we didn’t have a good result. “But Fernando always had a good word to lift us. Now 34, Namouchi has retired from professional football and is back in Cannes on the south coast of France, where he is starting out on his coaching career. He said: “I’ve got my UEFA A licence, and I’ve returned to the club where I started football, Entente Le Cannet-Rocheville. “I train the youngsters, and I’m also assistant coach with the senior team, who play in the fifth division. Top among those was his spell at Ibrox, though it didn’t end the way Hamouchi would have wanted. The Tunisian said: “I came to Rangers when I was young, and to get experience you have to play. “If the coach needs you in this position or that position then you cannot refuse. “In every club you have one player like this. If there is a hole, you know he can fill it because he can do the job. “I was that player for Alex McLeish. “But I had a lot of fun, and the Rangers fans understood this. I had many people at the club who supported me and told me what I was doing was good. “You will always have the ones who are not happy with you, but the most important thing is that the team needs to win and the club continues to win trophies. McLeish’s confidence in the young midfielder was evident, however, as he called upon the Tunisian in all of Rangers Champions League matches as the Gers became the first Scottish side to reach the last 16. “When we had big games he trusted me to do the hard work,” Namouchi said. “He knew that during these European nights, I was capable of something. During that season, we did some great things in the Champions League. The arrival of Paul Le Guen in the summer of 2006 spelt the end of Namouchi’s Rangers career, with the midfielder moving back to France in a £500,000 transfer to FC Lorient. It was hard to take for Namouchi, who had played every minute of Tunisia’s three group matches in their 2006 World Cup campaign in Germany. “When I talked to Le Guen, he said I could stay but I would be in competition with a new player he brought in,” Namouchi said. “I said OK, but soon after I got the opportunity to move to Lorient. “Of course, when Le Guen left so quickly, I had regrets and I was angry I had left Rangers. Spells at Freiburg in Germany and Grenoble back in France followed, before a three-year spell in Tunisia with Etoile sportive du Sahel and a brief stint at Lokomotiv Plovdiv in Bulgaria. Now back in France, Namouchi keeps a keen eye on the goings on at Ibrox. He believes the presence of Steven Gerrard will help make the task of attracting the best of Europe’s young talent to Ibrox easier. “I hope Rangers are on their way to returning to better days,” Namouchi said. “When the club was down, I was very sad because it’s a way of life for the fans. “Rangers need a top coach and a big name in charge. All the world knows Steven Gerrard, so for Rangers to have a name like him at the club is great. “He needs time to get things the way he wants, and to get the team to play the way he wants to play.